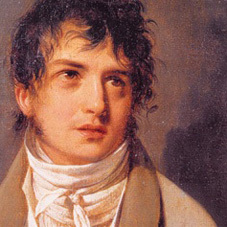 François-Adrien Boieldieu (1775 -1834) was a French composer, mainly of operas, often called "the French Mozart". Born during the Ancien Régime in Rouen, Adrien Boieldieu received his musical education first from the choirmaster and then from the organist of the local cathedral. During the Reign of Terror, Rouen was one of the few towns to maintain a significant musical life and in 1793 a series of concerts was organised featuring the celebrated violinist Pierre Rode and the tenor Pierre-Jean Garat. It was during this time that Boieldieu composed his earliest works to texts written by his father. During the Revolutionary period, Boieldieu left for Paris and wisely started work as a piano tuner. The spiritual heir of André Grétry, Boieldieu focused on melodies which avoided too much ornamentation, set to light but intelligent orchestration. Hector Berlioz described his music as possessing "a pleasing and tasteful Parisian elegance".